Last week, Oliver Wood visited our Coventry University London campus in the heart of Spitalfields to work with our academic colleagues on a series of module design sessions. 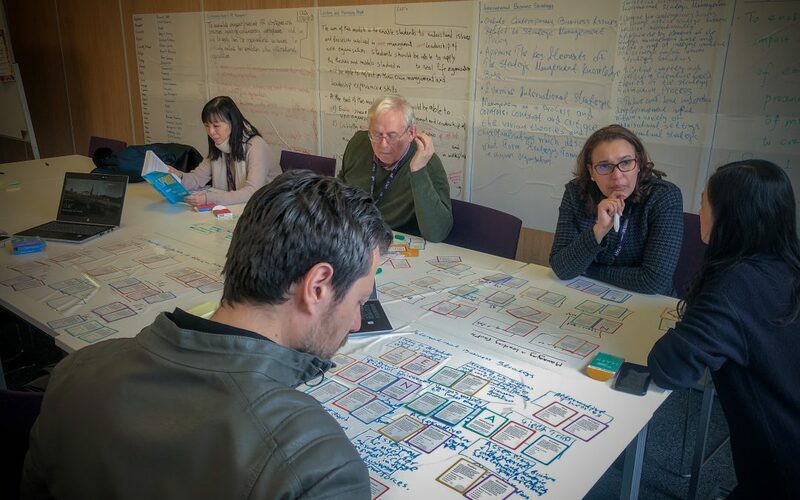 Drawing on our experiences of running CU SPRINT course design sessions and our wider curriculum design work, we delivered two sessions focused around the rapid development of innovative modules for a new masters-level course. The CU SPRINT is a Higher Education focused version of the Google Ventures Sprint and is designed to allow course teams the time, space, and resource to radically reconsider their offering starting backwards from the ideal graduate/customer. This design thinking approach is constructed to help course teams produce innovative and integrated courses fit for current and future graduates. The module design version of this course-level process draws on the same design thinking principles repackaged into the µSPRINT. A compressed version of the full sprint process, these one-day sessions are designed to build the structure and assessments of a module, whilst providing completed module information content. To begin, each Module Leader was asked to create a short two-sentence summary of the module. This statement is designed to sum up the outcome of the module for prospective students, and provides a concise statement to check ourselves against as decisions are made in the remainder of the day. An example of one of these module statements can be found below. The sessions then went on to collectively explore module learning outcomes, ensuring that these were pertinent to the module, study-level appropriate, and clearly related to the wider outcomes of the course. The value of the sprint process is enhanced through the conversation and collective knowledge of those in the room, with often the most simple of questions resulting in a complete re-think of the nomenclature used to covey the essence and substance of the module. It is this collective decision making and critical challenging that ensures both the quality of the module, and the place of that module within a wider course of study. Building on this, the session then makes use of the Beyond Flipped L·E·A·R·N methodology to begin to structure the delivery of the module itself. This simple five-step process is designed to get participants considering different approaches from the traditional lecture-seminar-homework teaching style. The process acts as prompts, however it is the module leaders who ultimately set the structure and assessment strategy for their subject area. In London, we used a combination of whiteboard paper and L·E·A·R·N play cards to rapidly prototype module content. The final step of the process is to explore assessment types. With the structure of the module produced, and a set of learning outcomes clear, the µSPRINT process encourages participants to consider what mode of assessment best fits the needs of the module. We encourage participants to think outside of the box, and explore some of the more innovative or technological approaches to assessment whilst discussing amongst themselves. Once the summative assessment has been solidified, we then go back to the module structure and build in our formative assessment opportunities. Again, we encourage participants to make best use of technology and use features such as self-assessment quizzes to help scaffold the students learning journey. With a module outline, structure, content, and assessment, the final stage of the journey is for the module teams to build the teaching content. Whilst we do offer support in this area, we tend to find this stage of the module build is best completed by the discipline experts. As with any of our visits, it has been a pleasure working with our London colleagues to continue building on prior successes and producing the best learning experiences we can for our students. To find out more about using the µSPRINT process to design modules you can visit the Beyond Flipped website or contact Oliver Wood, Innovation and Community Producer, by emailing oliver.wood@coventry.ac.uk.